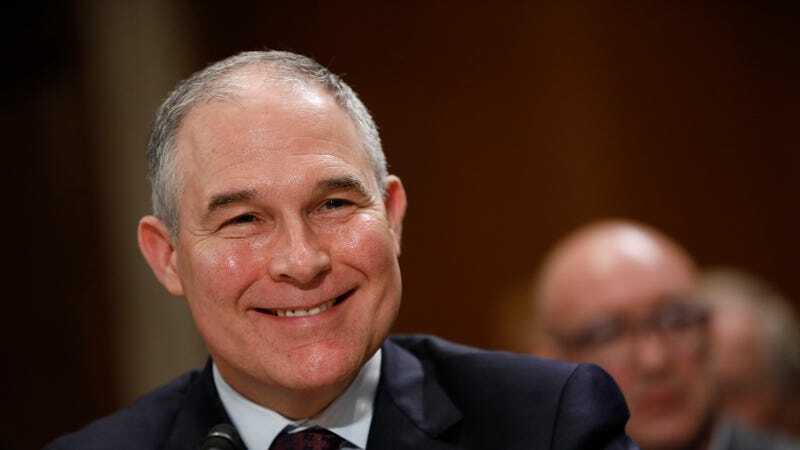 Early Friday afternoon the Senate confirmed former Oklahoma Attorney General Scott Pruitt to run the Environmental Protection Agency, an agency he holds in contempt and sued numerous times in his last job. Senators voted 52-46 to confirm Pruitt after weeks of push back from Democrats, environmental groups, and current and former EPA employees. Leading up to the final vote, Senate Democrats had been trying to get the confirmation hearing delayed until after next Tuesday, when the Oklahoma attorney general's office is under order to release around 3,000 of Pruitt's emails that relate to his exchanges with the fossil fuel industry. But, as has been the case with other partisan Trump Cabinet appointments, Republicans chose to push forward with little or no Democratic support. Only in Donald Trump’s chaotic administration does it make sense to put a menace to the environment in charge of the Environmental Protection Agency. For the last six years, Attorney General Pruitt has worked closely with big polluters to file lawsuit after lawsuit in largely failed attempts to block the EPA from doing its job to ensure Americans have safe water to drink and clean air to breathe. He’s opposed action to cut toxic mercury pollution that stunts children’s development. He’s opposed action to cut soot and smog pollution that triggers asthma attacks. He’s opposed action to clean up oil and gas operations that pollute the air in rural communities. He’s opposed any action to address the urgent threat of climate change. Responses to the laughably disingenuous tweet—for weeks, government social media accounts relating to the environment or science have been mum, with many worrying that much more sinister actions are taking place behind the scenes—started piling up immediately. They add a much needed human element to the announcement. @EPA you guys must be scared shitless ! I know I am!